Free Online image converter and online editing tools to change and enhance your photos on internet ! 5.000+ Facebook Members : Do you ? How can I open and convert an Image to PSD? ConvertImage knows how to write and convert your PSB photo in PSD format. ConvertImage opens automatically your PSB and PSD picture file and manages the native transparency of this format. ConvertImage is the online tool allowing you to simply convert the format of all your PSD images, for free, without having to install Gimp or to get Adobe Photoshop® on your PC or MAC. It is very practical and efficient for your daily work with pictures. In addition to convert your images in PSD format (Adobe Photoshop Picture file), ConvertImage can also crop your pictures online, rotate your image or create special effects on your pics, such as the classic but yet efficient black & white rendering… Just have a try! 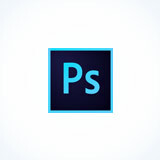 More Online Photo Tools ! In which format do you need to convert your image ? Standard Icon (16, 32, 48, 64) Please select which size you want your icon. We respect a total privacy while processing your file. We do not publish nor keep any file anywhere. All processed images are automatically deleted from our server 15 minutes after processing. Convert all your photos and pics on ConvertImage ! The law requires us to ask you for your preferences regarding your personal data. As "Tracking protection" is currently enabled in your browser, this prevents us to ask you for your preferences. Please first turn off the "Tracking protection", then we will ask you for your preferences. 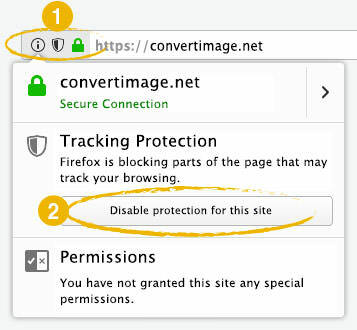 Click "Disable protection for this site"
NOTE : If the button is labelled "Disable protection for this session", you can proceed this alternative way. We must ask your preferences… but we cannot ! We recommend you to use the Google Chrome web browser, robust and fast on all sites. NOTE: Your preferences will be applied from the next page you will visit/load. Your privacy is precious: we respect it. By using this website, you consent that we use technologies such as anonymous statistics and cookies to improve your browsing experience on our site, customise content and advertising, and analyse our traffic. This anonymous information may be shared with our trusted social media, advertising and analytics partners. We do not collect any nominative data. Your files are processed 100% anonymously. We do not keep any file : They are automatically deleted from our servers 15 minutes after their processing. This cookie is necessary to remember your preferences. No data about you is used. This cookie is necessary to enable the core features of the website and is automatically activated when you use it. No data about you is used. Offers more complete image processing tools with more functionalities, to help you achieve the result you want faster and easier. No data about you is used. Offers greater consistency in the appearance of the website, including the links and topics that are proposed to you from one page to another. No data about you is used. Offers social sharing tools on the website pages (Ex. Facebook "Like" button). You will need to voluntarily click a share button to share the page on your favorite social network. No sharing will be done automatically. The proposed ads on the website are more relevant for you through the use of information on your device as well as your automatically determined geographical location. Anonymous data is shared with these ad suppliers. No nomitative data is used. We can enhance our site to fit your needs with personalized content by performing A/B tests to try out new features. Content may be adjusted randomly, or based on your browsing history on our site. The website will make usage of better translations to better fit to your language. No nomitative data is used. The usage of cookies on this site permits to enhance your online experience, ensure its proper functioning, improve its features, allow us to track our traffic, and provide you with relevant ads. You can customize or disable them totally, but unfortunately we cannot guarantee you the optimal performance and journey on our website. WARNING ! You have chosen to completely disable ALL cookies. It's your right, but please be aware that unfortunately we cannot guarantee you the optimal performance and journey on our website. Enable comments and allow you to post comments in certain areas of the website. No nomitative data is used. Facilitates your connection to the website and provides a secure connection. DID WE MAKE YOU HAPPY ? have a little thought for us as we continue the journey !